On this weekend one year ago, Bradford City were promoted to League One after defeating Northampton Town 3-0 at Wembley in the play off final. In the first of two articles looking back, Jason McKeown reflects on this unexpected achievement. It seemed as though everybody had given up, I know that I had. Promotion from League Two just wasn’t going to happen. Too much ground to make up, too little time remaining. A seventh straight year in the basement division beckoned, it was time to come to terms with this frustrating reality. My personal belief that we could do it was extinguished on a Tuesday evening at Plymouth, in the middle of March. Bradford City drew 0-0 with the then-basement club. And though the second half performance was good, the failure to turn late pressure into a winning goal seemed symbolic of what was surely to come in the final few weeks. I departed Home Park frustrated and deflated. There was plenty of consolation to take from the League Cup heroics that would ensure 2012/13 would go down as a good season, but in the league, it seemed, it was all over and all that was left was a nagging sense of what might have been. When, a few days later, City were thrashed 4-1 at play off contenders Exeter, it appeared to be confirmation that my immediate Plymouth reaction had been right. I listened to the St. James Park capitulation at home on the radio, and began to think about next season. 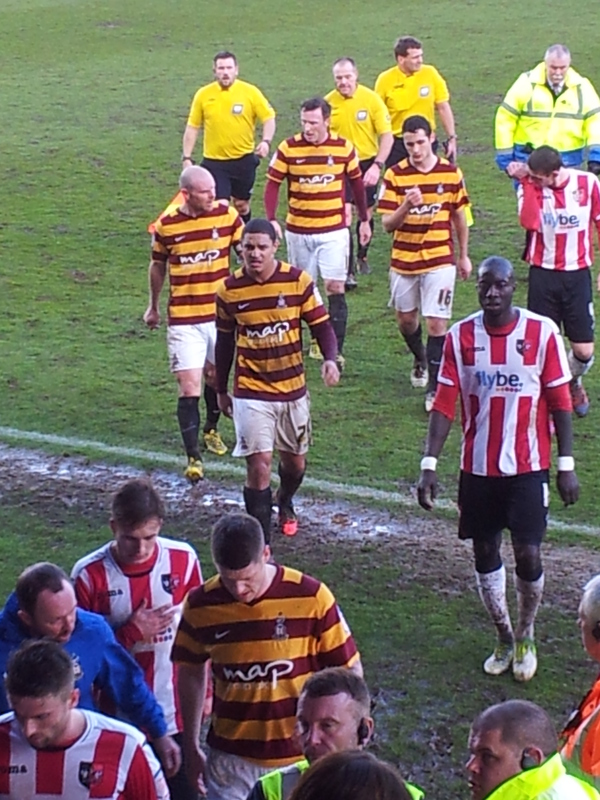 Defeat left the Bantams languishing in 11th place, 12 points behind the Grecians all be it with two games in hand. Too much ground to make up, too little time remaining. Year after year of watching failure suggested that a familiar tale was being played out in front of us again. Ah well, at least we had some fantastic memories to take away from this season. At least it wasn’t as bad a campaign as the last two. 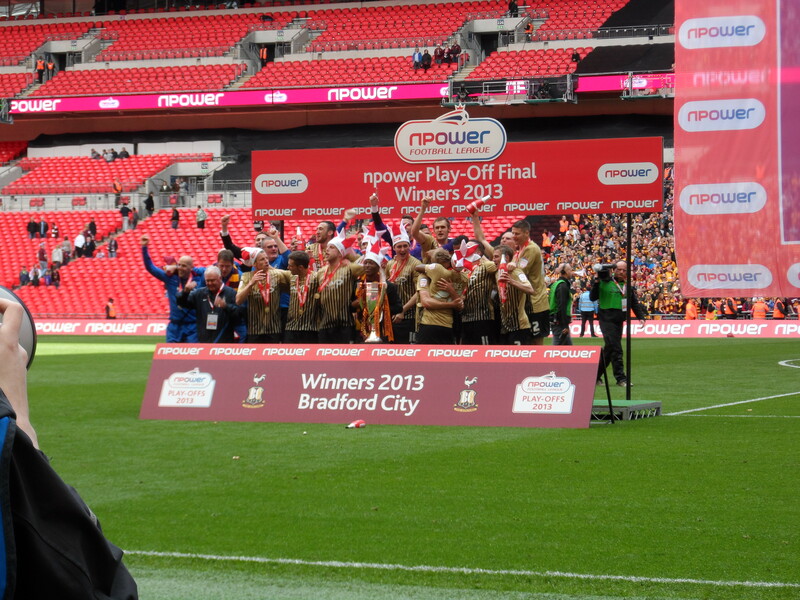 Two months and two days after the Exeter debacle, Bradford City were celebrating promotion at Wembley stadium. It was an incredible turn around in form. Started, it was said, the day after the Exeter defeat when Phil Parkinson held a summit meeting with his players. Whatever was said at the training ground that Sunday morning, it had a drastic effect. In the nine remaining games, City produced five wins, three draws and a defeat. Enough to secure the final play off place with a game to spare – a place they snatched from Exeter, for whom the 4-1 Bantams victory would be their final win of the season. Initially it was difficult to tell that anything special was beginning. The next league match was Wycombe at Valley Parade on a Tuesday, with an early Garry Thompson goal enough to settle a contest between two sides seemingly with little to play for. Any hopes of rekindling play off ambitions seemed to quickly extinguish in the next match, at home to Southend, as City found themselves 2-0 down after just 11 minutes. A commendable comeback saw Zavon Hines and James Hanson make it 2-2 with a minute remaining, but when Kyel Reid had a stoppage time penalty appeal turned away you assumed that that really was it. Easter Monday at Torquay was the true rebirth to the hopes. That City won 3-1 at Plainmoor wasn’t exactly earth-shattering, but the realisation that every other result had gone our way suddenly made promotion seem a realistic hope once more. We were back in this. Northampton were next at Valley Parade. Nahki Wells ended his personal goal drought with an early tap in, and it proved enough to secure back-to-back victories. Make that three in a row, after Bristol Rovers were swept aside in superb fashion three days later. 3-0 at half time through Wells (twice) and Andrew Davies; Thompson sealed a 4-1 win in the second half and, amazingly, City walked off the field at full time inside the play off places. Exciting, thrilling and unexpected times. Chesterfield away followed and the away end was bouncing. With the score 1-1, Ricky Ravenhill drilled home a lot shot from the edge of the box to spark wild celebrations. So good was City’s form and so indifferent those around them, that a top three finish was in grasp. A stoppage time equaliser by Chesterfield all but ruled that out, and the following Tuesday promotion rivals Rotherham punctured the mood with a smash and grab 2-0 Valley Parade victory. Forget automatic promotion; let’s just get over the play off line. 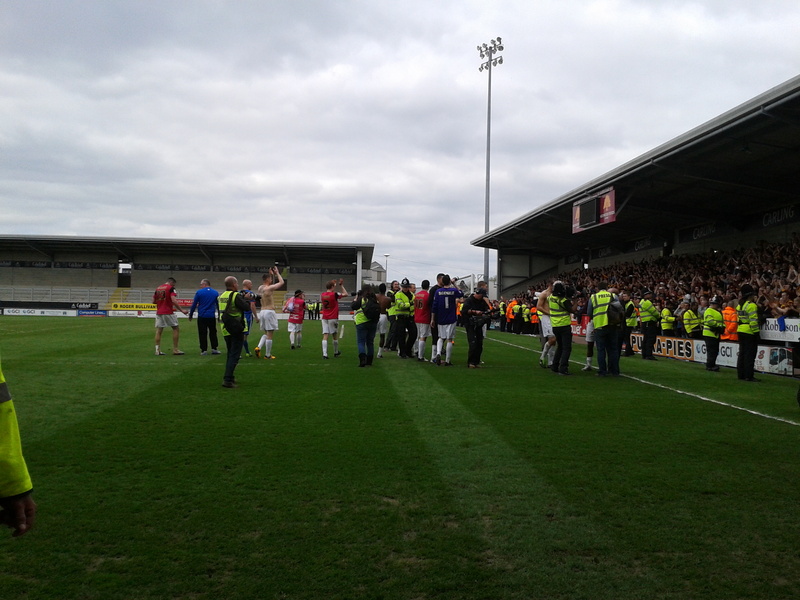 The final regular home game saw Burton Albion rock up. They looked ordinary, with Calvin Zola in the centre lifeless. Hanson scored a scrappy goal before half time, Lee Bell was sent off for the Brewers early in the second. City held on comfortably and, due to results elsewhere, were guaranteed a play off spot with a game to spare (a game that, at Cheltenham, was used to rest players). There were fantastic celebrations at full time. Finally, after five previous years where we only once came close, City were part of the end of season shootout. 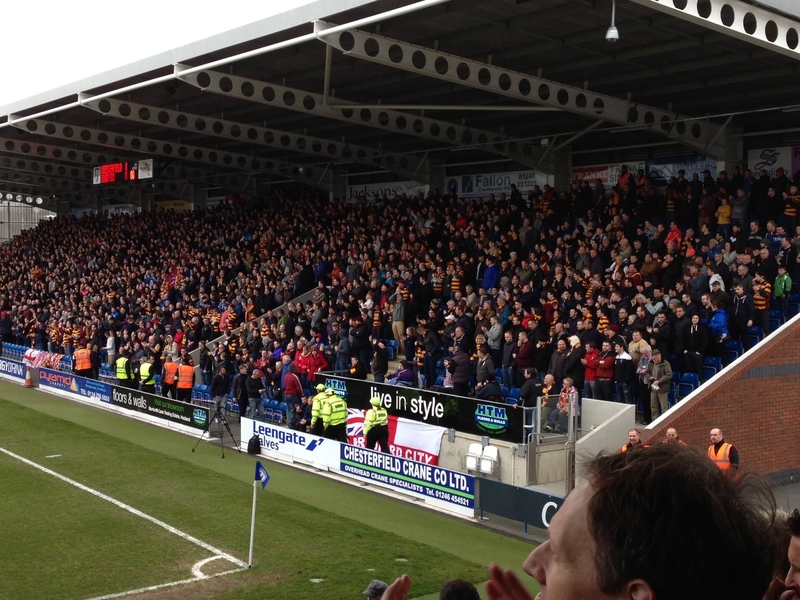 Burton were back for the play off semi finals, and in the first leg at Valley Parade looked a different side. They were far from ordinary, with Calvin Zola full of life. He scored two brilliant goals, Jacques Maghoma tore Stephen Darby to pieces. Half time and City went in 3-1 behind and in big trouble. The second half of the first leg was crucial. Burton failed to press home the fact that we were on the ropes and sat back on their lead. Thompson reduced the arrears with a quality strike from distance. We left the ground feeling disappointed but also relieved – Burton had let us off the hook. Whether we could turn it around at their ground was unclear, but there was certainly no way we would play as badly. Sunday May 5 was such a memorable day. The sun was shining brightly, the away end sold out, and as we drove up to Burton the pubs were packed out with City fans full of confidence. I really believed we would do it, although as soon as the game kicked off I was filled with terror and nerves about just what was at stake. This means everything. We started the game slowly, but then grew into it and – 27 minutes in – a mistake put Wells in to give City the lead and level the tie. Then, five minutes into the second half, Hanson struck a thunderbolt from the edge of the box that arrowed into the bottom corner. Pandemonium. Burton made it 2-1 straightaway to level the tie at 4-4, but then in another instant Wells had made it 3-1 and caused another outbreak of jubilant scenes behind the goal that he scored. What an afternoon Burton was. The impressive way that City came back, the sheer determination to get to the play off final and the brilliance of Wells and Hanson. “We’re proud of you” was sung at full time and the on-pitch celebrations seemed to go on another hour. Me and my group of friends kept the party going all night when we got back to Yorkshire. We’re off to Wembley, again. Saturday 18 May, 2013 began for me at 4am. I was riding down on a bus with the Skipton Bantams supporters club, which was departing at the ungodly hour of 5am. We were parked up on the edge of London before 9am, already merry from alcohol. A fry-up in a pub, a short underground journey to Wembley, and more beers in the Hilton Hotel next to the ground. 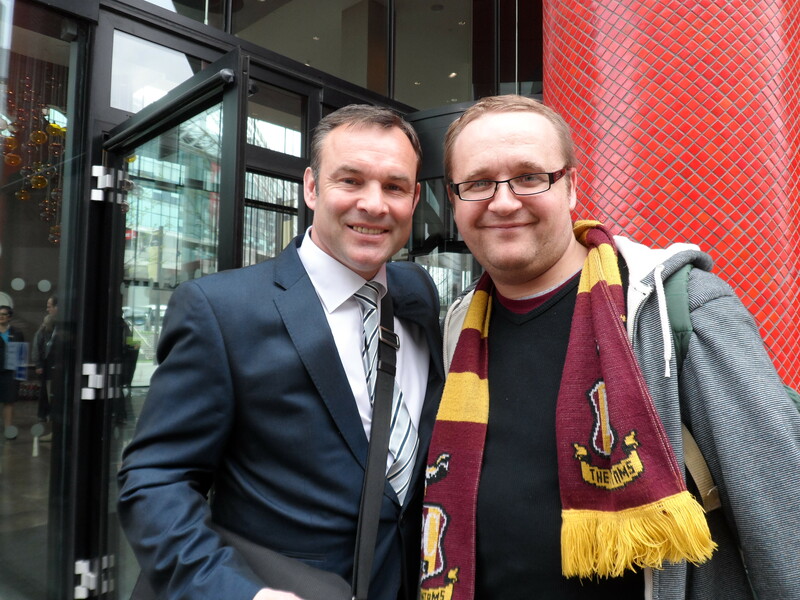 I even bumped into City legend and Sky pundit Peter Beagrie. His former team mate and another Bantams legend, Jamie Lawrence, was sat on the row behind me inside the stadium. Unlike the sheer I-can’t-believe-we-are-here-wow joy of the Swansea cup final, this visit to Wembley was filled with nerves, panic and fear. Game 64, and a whole season rested on this. It didn’t bear think about, losing twice here in one season, yet there was every chance that this was how it was going to end. The players clearly did not agree. They were so determined, so focused, so ruthless. They blew Northampton away in the first half. Hanson – goal! Everyone around me was hugging everyone. McArdle – goal! This is unbelievable. Wells – goal! 3-0 and only 28 minutes played. We celebrated in stunned disbelief. No one thought this would be easy, but that’s just what it was proving. Some people say the second half was an anti-climax, but I didn’t agree. The worry that Northampton might score kept me nervous, and then, as time ticked by and you realised that the improbable was now impossible, excitement grew. We have done it! Promotion, at last. Let’s have that final whistle blown, let’s begin the party, let’s ‘ave it! The moment of Gary Jones and Ravenhill jointly lifting the trophy will stay with me forever. 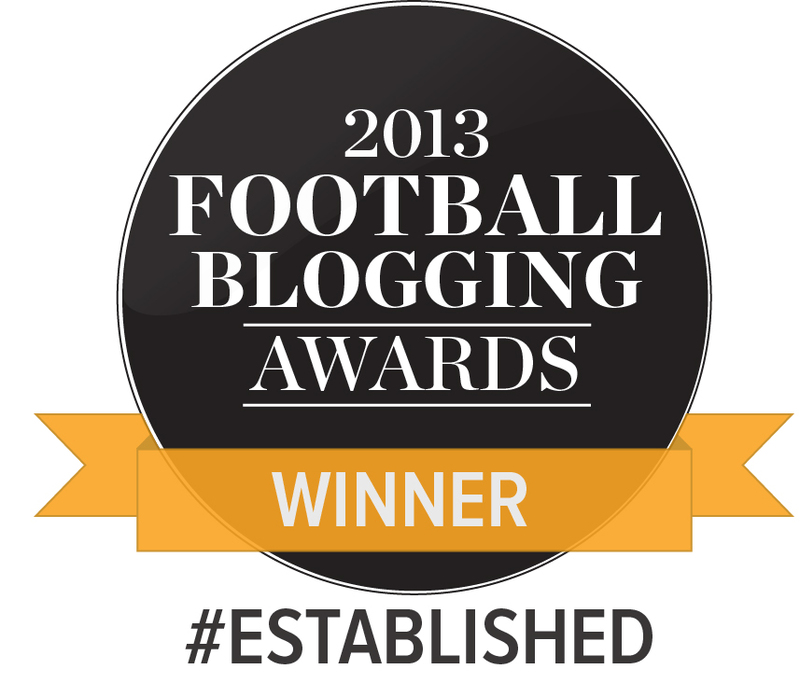 It was the near-perfect day, and to have finally escaped the bottom division meant the world to us supporters. I attended the Centenary Square open top bus ride a few days later to revel in more public celebrations. Supporting a football team like Bradford City carries one undisputable guarantee – the bad days will outnumber the good ones. It means that, when something truly special occurs, like a promotion, a cup run or a thrilling late victory, you savour the occasion that bit more because of what it means. Perhaps as Manchester City fans celebrated clinching the title last weekend, in a much more reserved fashion than when they won it two years earlier, they would reflect that the thrill of success dulls when it occurs more and more often. It was notable that when Man City fans talked of the bad times, they still referred to their brief flirtation with third tier football in 1998/99, rather than anything since their first Premier League title win. It might have been fun to support Man City this season, but it was probably even better in 2011/12, when it was all so new to them. 1998/99 was also the year of Bradford City’s last promotion. In between that day and the start of the 2012/13 season there had been an even greater ratio of bad days to good ones. Only defeating Liverpool to avoid Premier League relegation in 2000 counted as success over that period. The League Cup miracle was the first subsequent occasion of hedonistic times in 12 years, and it was continued with promotion in May. Of the two Wembley games, you’d have picked the play off final as the one to win. It all worked out perfectly, and for that we are left with a treasure chest of memories from 2012/13 that we will store lovingly until the day we die. For all we had been through in the 12 years prior, May 18, 2013 truly was one of the greatest days in the club’s history.